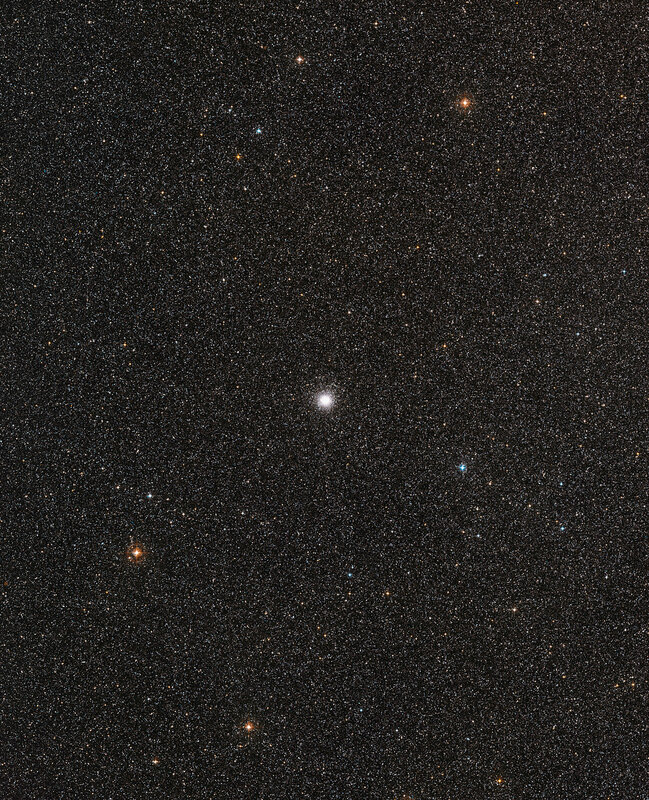 This new image from the VLT Survey Telescope at ESO’s Paranal Observatory in northern Chile shows a vast collection of stars, the globular cluster Messier 54. This cluster looks very similar to many others but it has a secret. Messier 54 doesn’t belong to the Milky Way, but is part of a small satellite galaxy, the Sagittarius Dwarf Galaxy. This unusual parentage has now allowed astronomers to use the Very Large Telescope (VLT) to test whether there are also unexpectedly low levels of the element lithium in stars outside the Milky Way. The Milky Way galaxy is orbited by more than 150 globular star clusters, which are balls of hundreds of thousands of old stars dating back to the formation of the galaxy. 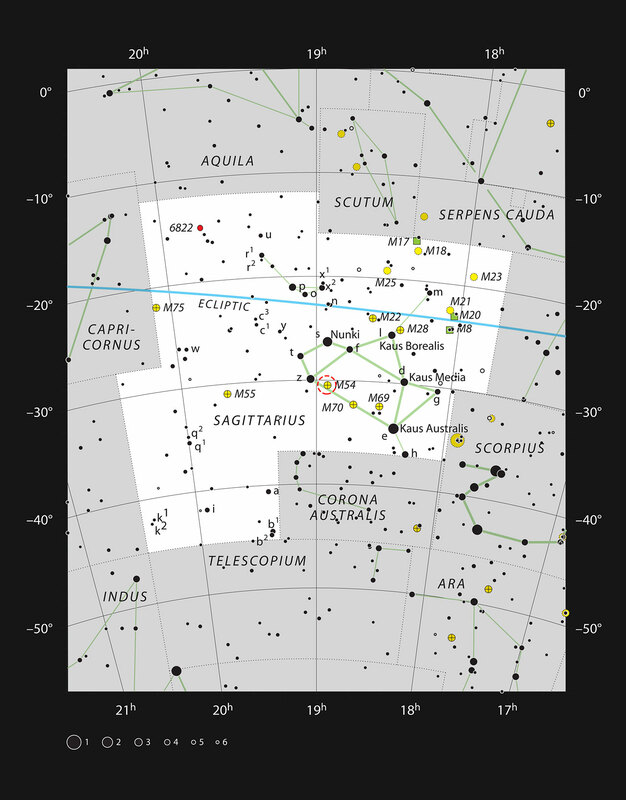 One of these, along with several others in the constellation of Sagittarius (The Archer), was found in the late eighteenth century by the French comet hunter Charles Messier and given the designation Messier 54. 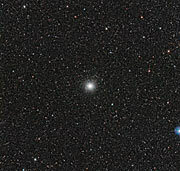 For more than two hundred years after its discovery Messier 54 was thought to be similar to the other Milky Way globulars. But in 1994 it was discovered that it was actually associated with a separate galaxy — the Sagittarius Dwarf Galaxy. It was found to be at a distance of around 90 000 light-years — more than three times as far from Earth as the galactic centre. Astronomers have now observed Messier 54 using the VLT as a test case to try to solve one of the mysteries of modern astronomy — the lithium problem. Most of the light chemical element lithium now present in the Universe was produced during the Big Bang, along with hydrogen and helium, but in much smaller quantities. Astronomers can calculate quite accurately how much lithium they expect to find in the early Universe, and from this work out how much they should see in old stars. But the numbers don’t match — there is about three times less lithium in stars than expected. This mystery remains, despite several decades of work . Up to now it has only been possible to measure lithium in stars in the Milky Way. 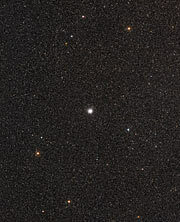 But now a team of astronomers led by Alessio Mucciarelli (University of Bologna, Italy) has used the VLT to measure how much lithium there is in a selection of stars in Messier 54. 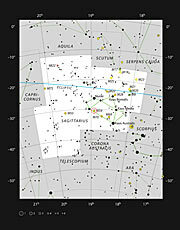 They find that the levels are close to those in the Milky Way. So, whatever it is that got rid of the lithium seems not to be specific to the Milky Way. This new image of the cluster was created from data taken with the VLT Survey Telescope (VST) at the Paranal Observatory. As well as showing the cluster itself it reveals the extraordinarily dense forest of much closer Milky Way stars that lie in the foreground. There are several possible proposed solutions to the riddle. The first is that the calculations of the amounts of lithium produced in the Big Bang are wrong — but very recent tests suggest that this is not the case. The second is that the lithium was somehow destroyed in the earliest stars, before the formation of the Milky Way. The third is that some process in the stars has gradually destroyed lithium during their lives. 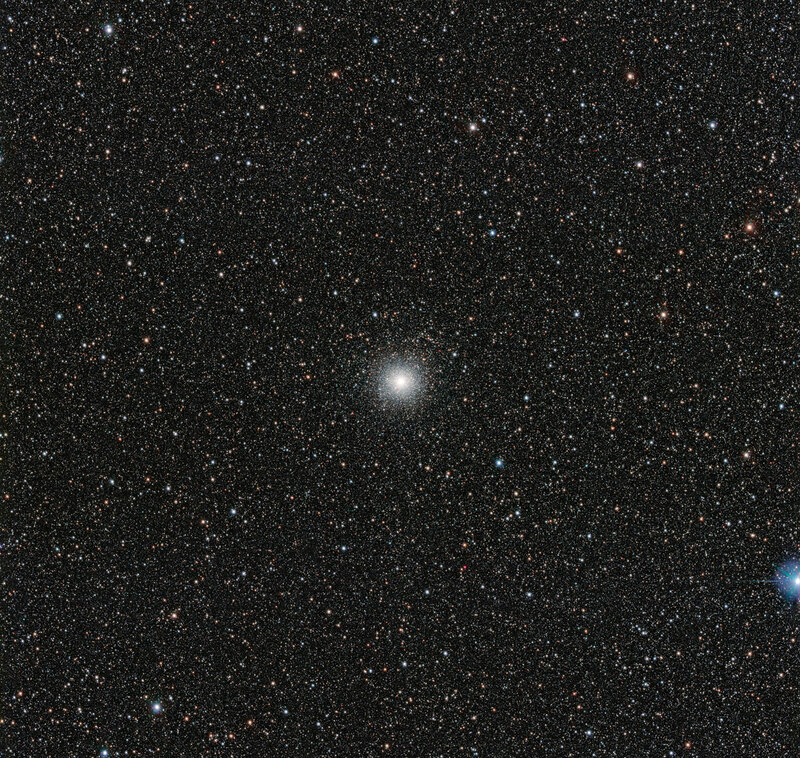 This research was presented in a paper, “The cosmological Lithium problem outside the Galaxy: the Sagittarius globular cluster M54”, by A. Mucciarelli et al., to appear in Monthly Notices of the Royal Astronomical Society (Oxford University Press). The team is composed of: A. Mucciarelli (University of Bologna, Italy), M. Salaris (Liverpool John Moores University, Liverpool, UK), P. Bonifacio (Observatoire de Paris, France), L. Monaco (ESO, Santiago, Chile) and S. Villanova (Universidad de Concepcion, Concepcion, Chile).